Broken Ground opens with an engrossing you-are-there scene of two men digging a hole in the earth under the light of a half moon. So vivid is the writing, readers will feel the ocean breeze on their skin as the men work. They'll smell the tang of seaweed, and hear the slap and wash of waves against the rocks. They'll even hear the sound of shovels entering the earth then casting off the dirt onto a pile. What are these men digging? And why? Whatever it's for, they need a ladder to get out of it. Like all Val McDermid's books, once you begin reading, you will simply not be able to stop. This is number five in the Detective Chief Inspector Karen Pirie cold case mystery series. Karen has been described as feisty. Some readers may use another word, one that starts with b and rhymes with twitchy. But she's bright, responsible, and fully devoted to solving old crimes. At the same time, she's irritable, impatient, not much fun at work, and has a problem with social graces. Karen explains herself: "I’m not here to make friends." We meet her when she arrives at her job as head of Scotland's Historic Cases Unit, and immediately clashes with her newly assigned investigator. Later on in a coffee shop, she rudely inserts herself into a private conversation taking place at the next table earning no praise or thanks all the while thinking she's doing her job and being of help. ". . . a yellow mini-digger squatted by the side of the road. A small cab with a flimsy roof perched on the top of a pair of caterpillar treads, its toothed bucket tucked under its folded arm like some sleeping mechanical bird. The paintwork was faded and the dents and scratches had been repainted in a not-quite-matching shade. . . .
"It was immediately apparent that Hamish knew what he was doing with the digger. He positioned the bucket on the far side of the staked-out area and lowered it with surprisingly smooth delicacy towards the surface of the rough bogland. The teeth bit through the coarse grasses and scrubby heather, digging into the peaty soil. They scraped a long scar across the surface, then Hamish maneuvered the bucket up and across, depositing the contents outside the baler twine he'd positioned as a guide." During this disinterment, two happy surprises are uncovered along with a not so happy surprise—a dead body preserved enough to be recognizable wearing Nikes, which are clearly not of the WWII era. Karen is called in to investigate. The story is set in Scotland, and McDermid's writing carries a reader's eye and mind smoothly across the page with barely a backward glance. New readers may trip up on her liberal use of regional idioms, expressions and turns of phrase, but not enough to put the book aside. Her books are interesting, tightly plotted down to the bone, and even educational. ". . . his torso twisted at the waist, making an awkward angle to his legs . . . the peat had stained his skin the colour of weak coffee, but apart from that, he was as perfectly preserved as a shop window mannequin. Short dark hair, well-shaped brows, long eyelashes—they were all clearly visible . . .The strong line of a square jaw and a small nose completed what was still a distinctively handsome face. . . well-developed musculature . . . a tattoo. 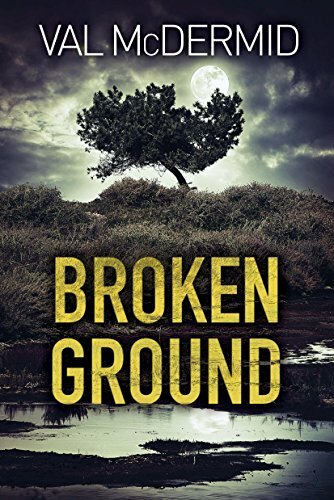 . ."
Broken Ground is a splendid read that won't disappoint.